Am I really writing a recipe for a salad? Really? Is that the real me? Yup! Guess why? It is because of the overeating at the canteens during the December Music Season. I kinda like the idea of a salad but get tired with the same dressing over and over again. I am starting to make some soups and salads (with a twist) with not so fancy ingredients but stuff available in the home pantry! So here’s the first one. Let me know how it turns out! 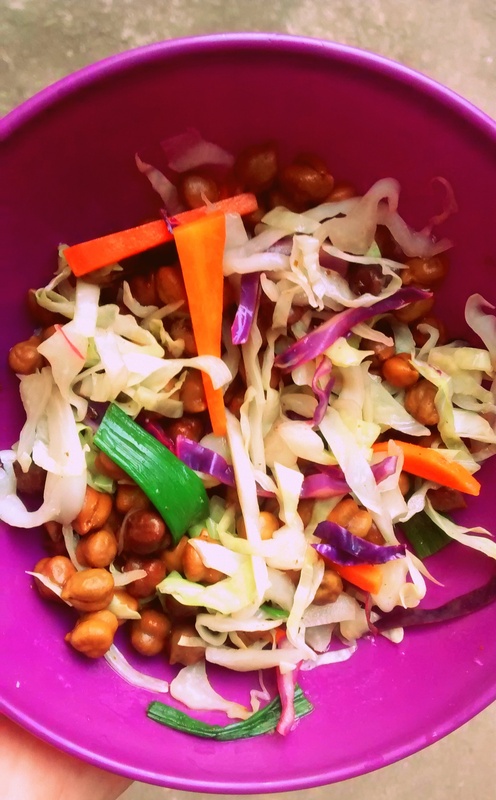 Throw in the shredded vegetables and boiled chickpeas and toss in the dressing. Serve warm or chilled with a slice of rustic bread! The salad I made was warm because the vegetables were still warm from being boiled. You can cool this down and serve chilled too. More soup and salad recipes coming up!